Taizé Let all who are thirsty come (Taizé Community) A lovely simple chant. Sheet music, sound samples for learning. *BUC Song Project Broken (Elaine Loukes) This song seeking God's open arms at the end of a dry journey fits this reading well. *Online Resource Dry (Paul Somerville) An excellent song seeking refreshment from the living water and grace of Christ. It will need a little time for teaching, or ask your musicians to sing it. We used this at Brunswick on Ash Wednesday. Unfortunately, it is not currently available online, but if you have a copy, dig it out! GtG078 You thirsty ones come to the spring! (Andrew Donaldson) Pretty tune and a simple paraphrase of this reading. The tune will need to be taught, but there are 5 verses, so it's worth it. Lyrics. G(3)815 The Thirsty Cry for Water Lord (Herman Stuempfle / Marty Haugen) Excellent words. The tune is pretty straightforward. Lead sheet. Sound sample. AoV1-074 Come To The Water (Frank Andersen) A beautiful paraphrase of this reading. Familiar to many, but easy to sing if not. It is not entirely inclusive. Lyrics. Online Resource / Tune In / NCYC 2009 / ATAR598 God has laid a feasting table / Invitation (Shawn Whelan). Feminine imagery of God gathering her guests to a feasting table. Sample and free downloadable songbook. *StS060 / G(II)538 / GC743 / GC(II)740 / G(3)842 / URW055 / Online Resource Come to me come to us you who are burdened (Rory Cooney) Very lovely, simple, welcoming song. Sound sample, and music for purchase. AoV1-151 / GtG479 / GA400 / G(II)350 / GC504 / GC(II)499 / RS 642 Oh Everyone Who Thirsts (To Everyone That Thirsts) / Come to the feast (Marty Haugen) Dramatic call and congregational response. This could be a lot of fun - don't try to do all the verses though... lyrics and sheet music sample. Sound sample (I'd probably do it more energetically than this sample). TiS 34 O Lord you are my God for you I long (John Dunn) Quite a nice paraphrase. Tune is not easy, but good once known. AoVNG30 / SP&P016 / Srce2-24 All who are thirsty for justice / Come to the Water (Ray Makeever) Nice song, and I really like the lyrics. 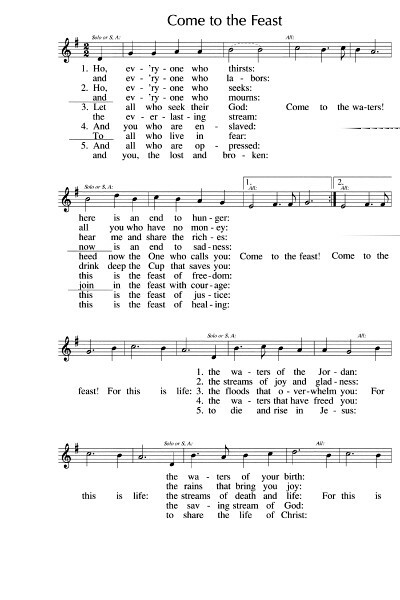 A good song to be sung by the musicians to welcome the congregation, or before communion. Could be schmaltzy if you're not careful. Lyrics and sound sample. ATW 435 Like the woman of old / Wellsprings (Don Stewart) A favourite song in our congregation about going to the "Wellsprings of life"and finding Jesus there. Picks up themes of tiredness, broken hearts and weariness, but makes the point that it's worth the effort. Taizé / MV102 / GC(II)648 / GC(3)752 Jesus your spirit in us (Taizé Community) "Jesus your spirit in us is a wellspring of life everlasting" Lyrics in English and German. Sheet music sample. Very very slow sound sample. You know, Taize music is not necessarily slow. When one of the brothers visited here, he strongly encouraged us not to be so slow! ATW 475 Come to the banquet there’s a place for you (Fay White) An excellent song by Melbourne singer and songwriter. "Though you maybe have no money, though you maybe feel unworthy, in your strength and in your weakness you are welcome, come." Lyrics. Good for kids. Psalm 63:1-8 Thirst for God, being satisfied. You have been my help, shadow of your wings, my soul clings to you. A lot of the songs for the Isaiah reading fit with the Psalm this week. CH142 A small thing like a hazelnut (Rae Whitney) Really nice words and a simple tune. Song about God's love for all things and all people. Lyrics. Good for kids. 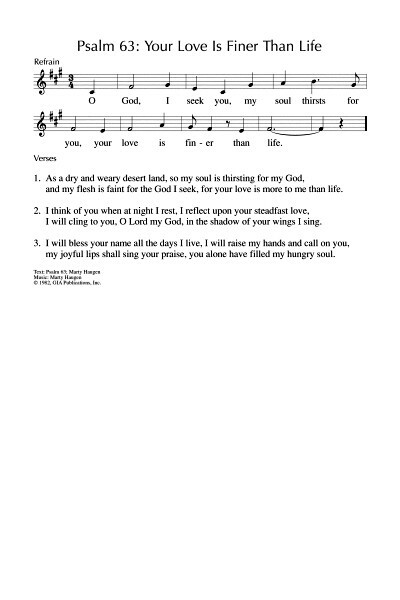 G(II)59 / GC63 As Morning Breaks / I Long for You (Mike Balhoff / Gary Daigle / Darryl Ducote) A simple cantor and response Psalm. Sound sample. BUC Song Project Broken (Elaine Loukes) This song seeking God's open arms at the end of a dry journey fits this reading well. URW281 In the shadow of your wings (Michael Joncas) A nice response - it has two sets of words. *CH720 / A&M409 / GtG470 / G(3)653 / SP204 / Lau941 There is a longing in our hearts O Lord (Anne Quigley) Good words of longing for God's love, justice, wisdom, healing. A good song for before, during or after intercessions. Sheet music sample. GA043 / G(II)58 / GC62 / GC(II)42 / G(3)058 / URW280 / Lau213 O God I Seek You (Marty Haugen) Nice cantor and refrain. Maybe a bit too mushy for some. Lyrics and sheet music sample. Sound sample. TiS 48 / AoV1-153 / ATOK 411 / VU808 / WoV779 / ELW787 / GA452 / HPP385 / GtG043 / G(II)433 / GC611 / GC(II)593 / G(3)691 / CP531 / W&R438 / PfAS091E / Cha077 / Lau952 You who dwell in the shelter of the Lord / On Eagle's Wings (Michael Joncas) This is a big favourite all over the place. It has masculine imagery for God. This doesn't have to be sung slowly and meditatively - it also works very well as a more upbeat song. If it is not familiar to you, a cantor can be used for the verses. It is not inclusive. Lyrics. TiS 47 / AHB 46 / AoV1-175 / NCH25 / CH161 / UMH117 / VU806 / LBW504 / ELW806 / GA459 / A&M746 / HPP1 / GtG687 / PH210 / GC614 / GC(II)588 / G(3)688 / CP528 / CP(E) 537 / W&R84 / Cha067 / Srce2-441 / URW200 / 82Hml-680 / PfAS090B / Lau955 / StF132 / MP498 O God our help in ages past (Isaac Watts) A good solid very well known hymn! The surprising thing about this one is that the language is inclusive for God in most sources. Not all sources are inclusive for humanity, so check. Lyrics and sheet music. Oldy-but-a-goody. You've got to live right. ATW 505 Whatever you do (John Ylvisaker) Simple and fun. Good for kids. TiS 494 / W&R678 / Cha375 In water we grow (Brian Wren) Great words, especially if you have a baptism this week. Tune is quite straightforward. Lyrics. Taizé / CH801 / MV170 / StJ / GtG205 / WoV665 / ELW642 / SFFS 2179 / GC408 / GC(II)430 / G(3)500 / CP553 / W&R399 / Cha523 / URW394 / StF783 / Lau244b Live in charity / Ubi Caritas (Jacques Berthier) Usually sung in Latin, but can also be sung just as beautifully as "Live in charity and steadfast love, live in charity; God will dwell with you." Sheet music and sound samples for practice. Good for kids. ATA 169 Doin' it all to the glory of God (Rod Boucher) Very silly and great fun for kids. Good for kids. Recorded Music Holy boldness (Shirley Caesar) Listen to this!! Cafe at the Gate of Salvation also recorded this. Patience and care for the fruitless fig tree; God's patience with us. Tune in / Online Resource Jesus is waiting (Dave Brown) An honest catchy rock song about our hesitation to follow and Jesus not only waiting, but continuing to work and change the world. A good sending-out song. Sound sample, lyrics and free downloadable songbook. Good for teenagers. The tide has turned songbook Love and joy peace and patience / Fruit of the spirit (Digby Hannah) Good words. Groovy chorus. Straightforward for congregational singing. *NCH586 Come to tend God's garden (John Dalles) Good words of growing a garden of justice and mercy. Sung to an English tune that will need to be taught (KING'S WESTON) if not familiar to your congregation. Very majestic youtube recording with lyrics listed in the comments. StS116 I saw a tree by the riverside / The Tree Song (Ken Medema) A great kid’s song about roots growing down to the water, and leaves growing up to the sunshine, and bearing fruit, and all that great stuff. Good for kids. Older style recording (Evie Tornquist!) Lyrics. AoV2-006 / The tide has turned Deeper River / There's a river running deep within the silence of our souls (Digby Hannah). An excellent song of restoration for tired desert-like souls. Lyrics. Online Resource One day the news was grim (Carolyn Winfrey Gillette) Excellent lyrics that have a good take on this passage and the way we always ask questions to try and understand what is difficult. Sung to the familiar tune LEONI. Lyrics. New words to old tunes. Recorded Music Though the fig tree may not blossom (Lara George) This is a gorgeous song about having faith that God will not forget us, and one year, our very talented Elaine Loukes Potter sang it during the offering. Lyrics. Recording. 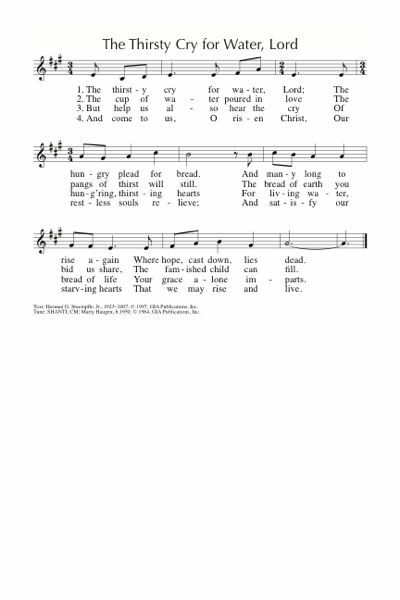 For the Psalm: combine "Your Love, O Lord" by Third Day and "Better Is One Day". Two repetitive contemporary songs that when put together give a richer presentation. I'm working out what keys to do them in right now. 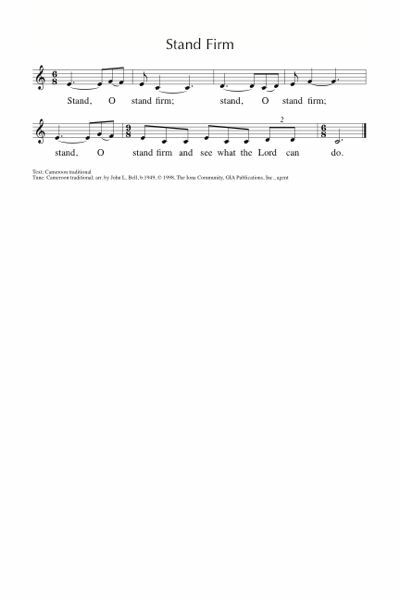 Is it my computer or is there a wrong link for the hymn "I saw a Tree By the Riverside" under the gospel of Luke readings. I clicked the "lyrics" to see if it was the same song I already knew and 3 times it took me to a German language blog with nothing to do with the song...just thought you might want to check it? Thanks for alerting me to the strange link - I have found another site that has the lyrics.